Your ticket will include a sit down dinner, drinks, dessert, entertainment and a swag bag. A table seats 10 guests including your ticket and will include a sit down dinner, drinks, dessert, entertainment and a swag bag. Your ticket will include a sit down dinner, drinks, dessert, and entertainment. Your 10 tickets will include a sit down dinner, drinks, dessert, and entertainment. Dog must be good with all people, all dogs, on a proper leash (no retractable) and not a marker! You will be responsible for your pet and any damage done. Your tax-deductible contribution to Fetching Tails Foundation is vital in helping us rescue, rehabilitate and find loving homes for unwanted dogs who are homeless, neglected or abused. With whom do you wish to be seated? With whom do you want to be seated? 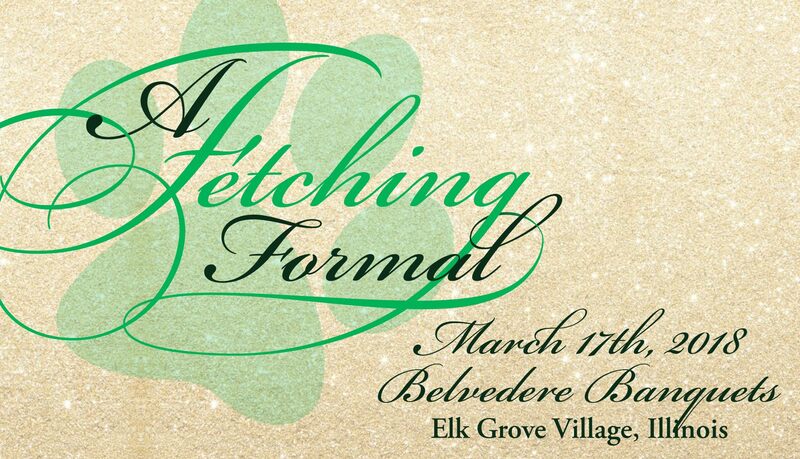 Fetching Tails Foundation is hosting our 3rd gala, A Fetching Formal at Belvedere Banquets in Elk Grove Village. Over 200 guests will enjoy dinner, drinks, a silent auction, live entertainment and more on March 17th, 2018! A Fetching Formal will raise critical funds to enable Fetching Tails Foundation to increase their rate of rescue and adoption in 2018. On the menu: Hors-d'oeuvres served, Fresh salad station, Pasta Bar with options of Marinara/Vodka sauce, Corned Beef, Boiled Potatoes, Cabbage and Irish Soda Bread, Dessert and non-alcoholic and selected alcohol included!